JOPLIN, Mo. — Bill Davis, head meteorologist with the National Weather Service at Springfield, did not mince words Tuesday when he described the tornado that struck Joplin on Sunday. “There were a few little swirling vortexes, and then it came down like a fist coming right out of the sky,” he said. Davis, part of a team that arrived in Joplin on Monday to assess the damage, said the tornado that struck Joplin was the most powerful of all on the Enhanced Fujita Scale — an EF-5. Wind speeds exceeded 200 mph. Jefferson City, Mo. 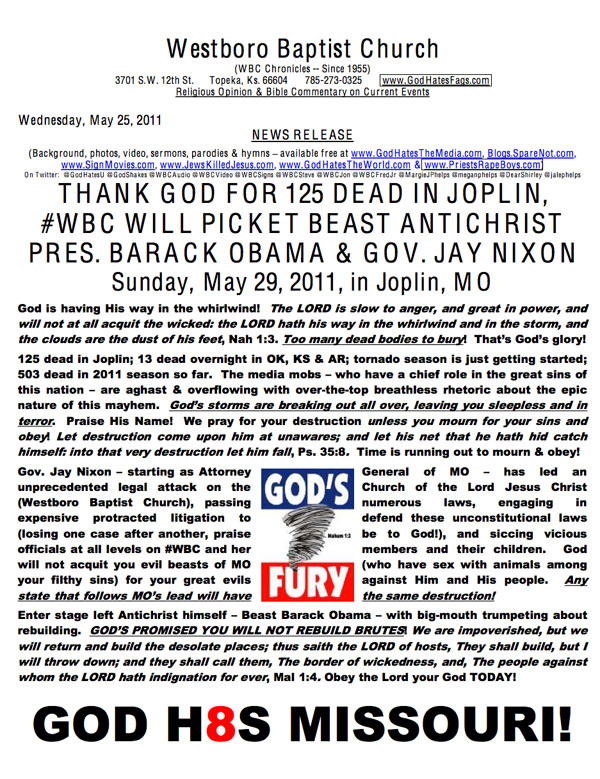 — Attorney General Chris Koster warned individuals and businesses against price-gouging following the devastating tornado in Joplin. Koster’s office is sending investigators to the area to monitor for price-gouging and to examine any allegations on-site. The Attorney General urged any person who believes a business has suddenly and artificially raised the prices on necessities including gas, food, diapers, clean-up equipment, etc., should contact his office at 1-800-392-8222, or online at ago.mo.gov to file the complaint. Rising Water in Joplin complicating issues. Early reports via Jasper County Law Enforcement Agencies are indicating a house may have collapsed in Joplin trapping 2 to 4 people inside. Rising water in some areas is also starting to complicate rescue work in the Joplin area. Near Joplin one man is trapped on top of his vehicle and a rescue boat has been dispatched to the scene. Watch for updated reports.